O ‘tis a joy to behold. Otis is a very handsome gentleman registered as “Spilsbury Eccles” who arrived in the summer of 2012 as a nine-year old. 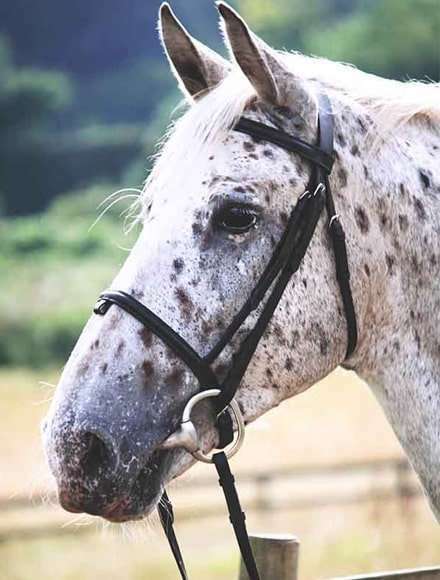 Our first leopard-spot horse after over forty years and he hasn’t let us down. A striking lead horse who is equally happy in the middle of the ride when enjoying the forest hacks. The more experienced rider will enjoy him demonstrating his work in the indoor school. A striking lead horse standing 16hh 2 who is equally happy in the middle of the ride when enjoying the forest hacks.